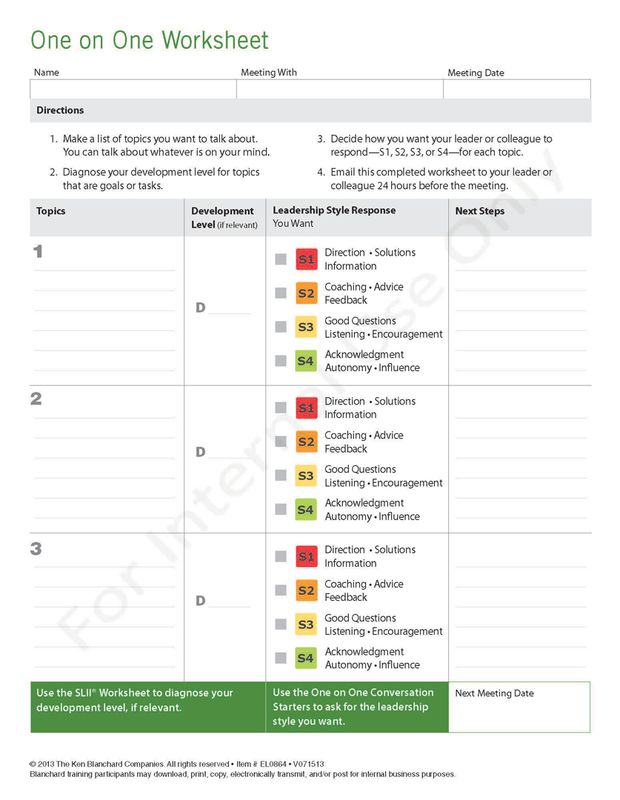 Situational Leadership® II (SLII®) is the most widely taught leadership model in the world. SLII creates a shared process, language, and model for building leadership across all levels of an organization. The new learning design, The SLII Experience, uses game-changing techniques that immerse leaders in SLII® quickly, deeply, and effectively. The outcome is that leaders get up to speed and start using SLII faster than ever before. The foundation of SLII® lies in teaching leaders to diagnose the needs of an individual or a team and then use the appropriate leadership style to respond to the needs of the person. Highly engaging classroom activities are coupled with pre- and post-tools to help reinforce and measure learning. 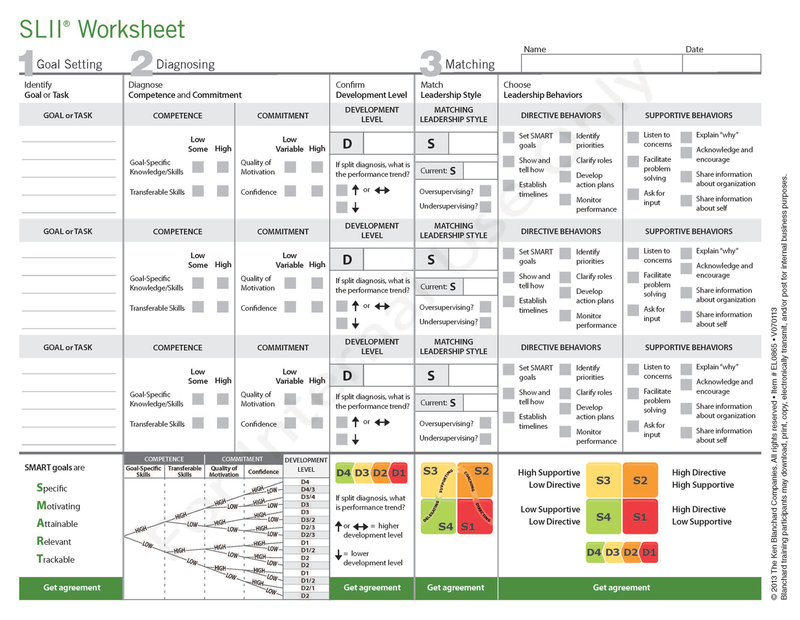 Short, fast-paced learning scenarios use real work problems. The outcome is that leaders get up-to-speed and start using SLII® faster than ever before. Participants are taken to the edge of their comfort zone with challenging activities that require them to demonstrate their familiarity with SLII®content and teach them how to specifically integrate material into their leadership. Emotionally compelling videos draw leaders into real work challenges, showing them the painful ramifications of not using SLII®. Videos model effective peer-to-peer interactions and "match and mismatch" scenarios in various situations and managers. Participants access videos, game cards, conversation starters, and a new 12-module SLII® Challenge. There is also an SLII® Diagnosis Application for smart phones and mobile tablets, enabling diagnosis and coaching in real-time! 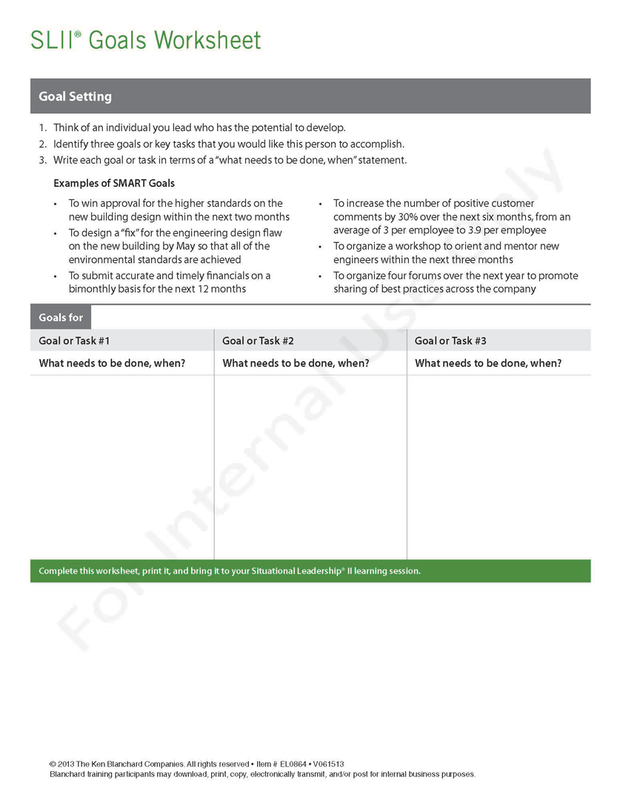 The SLII Fitness Test, Goals Worksheet, SLII Worksheet, and One on One Worksheet provided in training are available online for managers to use. An added plus! A new 35-minute online learning module enables managers to share what they have learned so everyone on their team is exposed to and can use the language of SLII®. It is an unprecedented approach to leadership training that improves the performance of an entire work team. Our certified facilitators work with you to align SLII® with your leader development strategy and unique business challenges. Facilitated sessions are prepared so that they link to your organization’s language and participant realities – making our facilitation highly personal and relevant to each and every manager. One-on-One coaching post participant SLII® Experience ensures accountability for application of learning and helps measure participant progress. We also facilitate Blanchard’s Blending Learning Solution, which couples on-line participant learning with virtual or face-to-face facilitation. Training for Trainers (T4T) is offered directly from the Ken Blanchard Companies. T4T sessions are held throughout the world. The SLII ®Experience JumpStart for Trainers is for trainers looking to convert their organization to the next generation of SLII thinking. JumpStart allows you to interact with new videos, new conversation starters, new worksheets, and on-the-job reinforcement resources. Learn how to effectively lead a fast-paced learning experience that focuses on practice vs. lecture. Blanchard’s Blending Learning Solution, couples on-line participant learning with virtual or face-to-face facilitation.